Drug addiction is a growing epidemic in the United States. The Center for Disease Control (CDC) reported that 7.9 percent of persons 12 years of age and older used illicit drugs during the month preceding a study in 2004. Children get exposed to drugs and drug use in high school and even in middle school. 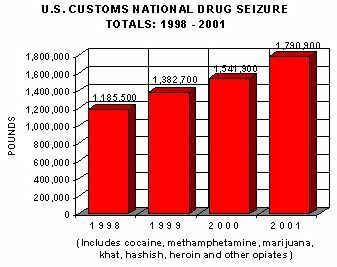 The growing problem can be seen from the number of pounds of illegal drugs seized by the U.S. Customs Service. On March 22, 2007 the U.S. Coast Guard and the U.S. Drug Enforcement Administration seized a ship carrying more than 42,800 pounds of cocaine. This was the single largest maritime drug seizure in U.S. history, but it represents just a fraction of the drugs that actually enter the U.S. Curiosity and peer pressure are two of the leading reasons why people experiment with tobacco, alcohol, and drugs. Sometimes, addiction is the result of using prescription drugs without adequate medical supervision. Addiction may also result when greedy manufacturers fail to adequately state the addictive potential of some drugs. In 2007, the makers of the pain killer OxyContin, an opium derivative, agreed to pay $635 million Dollars in penalties for fraudulently understating the addictive potential of the drug. As a result, many patients became addicted and had great difficulty withdrawing from OxyContin and its generic equivalent, oxycodone. School-age children may start by inhaling helium from balloons to speak like Donald Duck, and then go on to sniffing aerosols. Young people who live in households where the adults smoke or drink are more likely to think that it is normal to use these potentially addictive substances. Teenagers who intentionally abuse prescription pain killers and over-the-counter cough syrups and cold medicines to get high usually find the drugs in the medicine cabinets of family members and friends. Many problems with alcohol and drugs start when students move away from parental supervision to attend college. Students who are immature and lack experience making independent decisions may think that drugs and alcohol provide a harmless way to have a good time and enjoy a party more, or they may be pressured to participate in activities such as chug-a-lug contests that encourage overconsumption of alcoholic beverages and set the stage for habitual binge drinking and alcoholism. The rising number of teenage drug abuse cases should be a cause for concern not only for parents, but for governments as well, which should do everything to tackle this problem.